Does you little one go adventuring regardless of where he/she is? Just to make sure that your kids are all right and well equipped just in case they decide to get themselves in a tight spot (i.e. checking out dark tunnels which generations of rabbits and moles have burrowed through), you might want to consider a head lamp that is extremely appealing – especially when it comes with a Lego minifig. We’re talking about the Lego Head Lamp here, people. It helps one navigate through dark areas without encumbering your hands, and you can turn it off and on with but a single click. The light is much more focused compared to a candle, and it can be clipped onto a myriad of items including your backpack, jacket or belt among others. 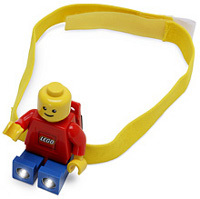 The Lego Head Lamp is available for $11.99. Beriscope: See underwater, from land!